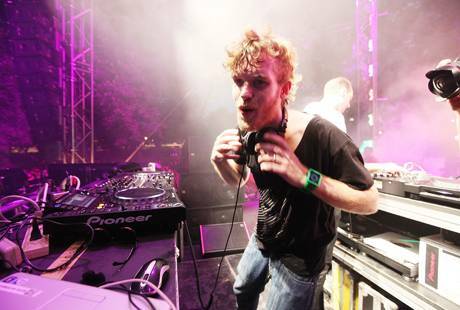 Christopher Mercer, aka Rusko, is probably the most hyperactive DJ I have ever seen live. Following support from fellow UK DJ Doorly, the curtains on the Commodore stage pulled back revealing an enormous set of letters in lights. You guessed it, those letters spelt “Rusko”. The unique brand of dubstep that Rusko has made so popular with an eclectic mix of fans certainly brought out a high number of inebriated ravers on an otherwise quiet Sunday night. Instead of sticking to the darker side of dubstep, the DJ – following his graduation from Leeds College of Music with a degree in Music Production – made his production debut in 2006 with a more upbeat sound that appeals to a much wider audience. This has been quite controversial amongst dubstep fans who usually love or hate the more commercial-sounding style – a style that has allowed Rusko to work with mainstream acts as big as M.I.A. and most recently Britney Spears. Heck, dubstep has had one hell of a journey making it from small underground venues in England to now even appearing on Pitchfork and high up in the charts. And Rusko’s music is definitely part of the journey. His dynamic set included his most popular tune, “Woo Boost”, which is full of wobbly synth, big bass, sirens, and the “woo” for which it was presumably named after, along with a remix of Kid Cudi‘s “Day ‘N’ Night”. He played a lot from his 2010 album O.M.G! including “Rubadub Shakedown”, which has a Jamaican dub feel to it, and “Kumon Kumon”, which is dotted with laser sound effects. Rusko also included an unexpected and brief musical interlude in which he played old timey jazz music and did “the walking man” on-stage in time to the beat, much to the crowd’s appreciation. Who knows where dub-step is headed commercially, but for now Rusko is set to fill venues throughout North America and the UK. This entry was posted in concert reviews and tagged concerts, reviews, Rusko, Vancouver. Bookmark the permalink.